Author Dawn Tripp finally has something that all debut authors wish they had, which is ten years' experience with receiving reviews. 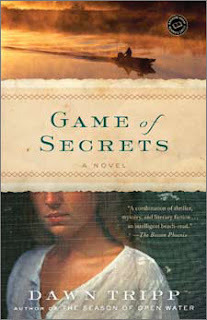 As her beautiful novel Game of Secrets is published in paperback today, Tripp reflects back on her learning process. The advice she offers here may be some of the most valuable ever to grace Blurb is a Verb... and also, the most difficult advice for first-time novelists to take. --Sarah P.
Several months before my first novel came out, the good news began to roll in. We received a blurb from Edna O’Brien, my living hero, who described the book as “a shimmering work, an audacious debut, a gem.” Random House was sending me on a tour. 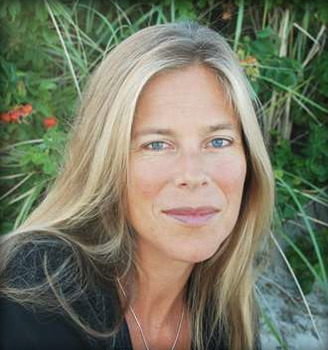 The novel was going to be reviewed in People, featured in Elle; it was going to be in a summer round-up for USA-Today. I was thrilled. I was anxious. I walked around every day feeling like I was at the edge of a cliff. My stomach was in my throat, and my whole sense of normal, for some reason I could not pin down, was on its ear. And it was hard to explain this feeling of angst to anyone, because my friends and family, and the other writers I knew, kept telling me how lucky I was, how excited they were for me, and I kept thinking there was something all wrong that I couldn’t seem to feel the same unbridled joy. I couldn’t escape the sense that what was about to happen—publication—had very little to do with the actual process and art of writing. But again, it was my first time through a book release, and it was hard to put these feelings into words and harder, too, to justify them. Needless to say, in the moment, I couldn’t quite take her advice. For the next few weeks, after that scathing PW, I couldn’t seem to write at all. I could barely focus on the draft of my second novel even though it was nearly finished. But in the ten years since, I have come to see those first two reviews as a gift—both of them as a gift. In the span of four days—I got a pure rave and I got the worst review I’ve ever received. And I have come to see that neither of them really has much to do with what I am called to do, as a writer. Reviews come. You get the praise, the raves, you get the mixed, you get it all, and at the end of the day, what really matters is that there was a story you loved once, that burned in you enough that you took a year or two of your life and wrote it down. What matters is that there are the glimmers of a new story, perhaps a new novel, moving in your body, prickling around like liquid silver in your veins, and snapping you awake at 3 a.m. I have learned this: Whether someone loves what I’ve done, or whether it just isn’t their cup of tea, someone else’s reaction to a book I’ve written has very little to do with why I was driven to write that book in the first place. It has very little to do with what still drives me to wake up every day, go to my desk, and pour myself into the page. Just write. Trust your own voice. Trust your own instincts. Find a story that you are on fire to tell. And write. You can find Dawn Tripp at www.DawnTripp.com, and Game of Secrets wherever books are sold. What great perspective, Dawn—thank you for sharing this! I think so too! I'm going to try to repeat: *they're a gift* *they're a gift*... like a mantra. I'll let you know how that goes! Thank you Camille and Sarah! Dawn, this is a great piece. I'm going to ask you to repeat this advice to me, many times, when it's my turn to hear it. One of the concepts I especially like about this essay, though, has to do not with the wisdom about "just writing" but about that unnameable feeling of anxiety around one's landmarks of success that non-writers can't quite understand. I'm not sure why we don't readily jump up and down when we get an agent, a contract, a pub date, but most of us don't. I wonder if it's because we're so used to living with the long process that the milestones of completion unnerve us? Could be that. Could also be that we imagine that having that external validation will somehow define or determine what we have written and what we will write. But, at least in my experience, the drive to write comes from something much deeper, and really something that runs out of a separate vein. Wow, Dawn. What beautiful, lovely advice. Thank you so much for sharing it. And I'm so happy your dreams (through hard work) are coming true! Thank you, Dawn. I needed to hear these words just now. I will bookmark this and return to it in days to come! I agree with Kim Wright. Every writer should read them along with your beautiful books. Must share with my Facebook pals. Thanks, Dawn. Based upon this post alone, I think I ought to cancel my subscription to PW. Thanks for reminding me why I do this in the first place. I love this, Dawn. Very apt advice on the publication date of my first novel, which has gotten great reviews so far EXCEPT from Publisher's Weekly, which also thought I was far too slow. You and I are sisters in PW disdain. That's great advice -- the kind that is sometimes hard to heed, but so important! What an insightful post! Thank you. I am a debut novelist who also received a fantastic review followed by a similarly scathing one. I spent the day feeling personally wounded (and branded) and hateful, until my wise son who has read the book said 'But she didn't understand! It's okay! This is laughable! That helped. Though it's so true these moments of ecstasy and pain both tug us away from our original task and inspiration. After all this promotion I can't wait to get writing again! Perfect timing for me! I needed this right here, right now.